Connects directly to standard suction lines. 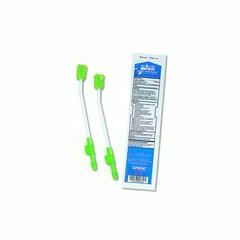 Toothette Suction Swab Single Use System is designed for professionals with patients who cannot expectorate and cannot perform their own oral care. Provides complete oral hygiene with suctioning for patients who may also suffer from mild, moderate or even severe oral dysfunction. Attach to standard suction line for single-handed cleaning, debriding and suctioning in one easy-to-use tool. Patient is more comfortable and experiences less trauma then with Yankauer or other suction instrument. System contains 2 Suction Swabs with Sodium Bicarbonate, 0.25 fl Oz/7 ml in a burst of ready-to-use Perox-A-Mint® 1.5% hydrogen peroxide solution that re-hydrates the oral mucosa. Comes in convenient, economical dispenser box for bedside oral care. Poor Air Quality. Warm Climates. Problem swallowing. Humid Climates. Homeowner. Parent of handicapped son. My handicapped son has a high palate and is unable to handle his secretions without aspirating. These suction swabs are the only device we've found that enable us to get up into the palate to suction without damaging the skin. Cleans Hard To Reach Spots. Durable. Easy To Use. Gentle On Gums. Clean Teeth. Easy To Use. Gentle On Gums. Cleans Hard To Reach Spots. The patient suffered a stroke; I use the product to clean his mouth and tongue. It is the best thing that I have come across, the suction prevents the patient from swallowing too much water and thus help prevents pneumonia. I will be ordering an additional supply of this product. by Bouie from District of Columbia (Washington, D.C.
Easy To Use. Durable. Clean Teeth. Cleans Hard To Reach Spots. Gentle On Gums. Daily Use. Bad Breath. Prevent Cavities. Travel. Total care patient. Frequent User. Daily Use. Bad Breath. Travel. Warm Climates. Humid Climates. My sister has oral cancer and this swab was the only one she would use. I couldn't find it in any store, but I found it online and Allegro sent it out pronto. Very happy with the product and the company in this confusing and ever changing world of cancer. Can these be applied towards health savings account?